I am not generally drawn to historical fiction, but found myself one day a couple of months ago in the situation of needing a new novel to read, having The Book of Negroes close at hand and deciding to give it a chance. I am glad that I did. The Book of Negroes is a sprawling tale that crisscrosses the globe, from a village in Africa to an indigo plantation in South Carolina, from New York to Nova Scotia, from Sierra Leone to London. It is the story of Aminata Diallo, possibly one of the strongest and most resourceful female characters to lead a novel in quite some time. The Book of Negroes opens in London in 1802 where Aminata, now an old woman, has relocated in order to testify on behalf of abolitionists. The story unfolds as the former slave looks back on her life. It has been a life filled with brutality and hardship, but also with resolve and friendship and humanity found in unlikely places. Snatched from her African village by slave traders at the age of eleven, Aminata is marched in a slave coffle for three months before reaching the coast and a slave ship destined for America. Having learned midwifery from her mother and reading and writing from her father, Aminata draws on those skills for survival in a brutal world. She proves to be a resourceful, determined woman, able to live by her wits, to teach and inspire others, despite the loss of so many dear to her. The title of the book (which comes with its own side-story of controversy) comes from a historical document kept by British naval officers to document black loyalists who, through their service to England, were permitted to flee Manhattan in the late 1700's for freedom in Nova Scotia. I was chagrined to realize that I knew very little about the former slaves who struggled to make a life for themselves in Nova Scotia. My knowledge of Canadian history has some obvious gaps. 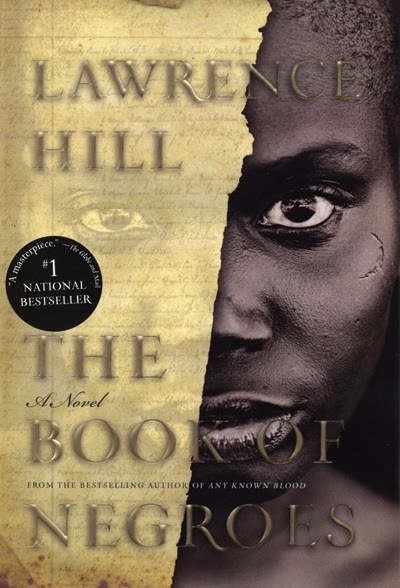 In The Book of Negroes, Lawrence Hill has written a compelling, well-researched novel that seamlessly weaves documented historical events and real people into a story that is at once rivetting, shocking, and uplifting. And his greatest triumph is in his creation of Aminata Diallo herself. She may be a product of Hill's fertile imagination, but to me she is very present and very real. Her courage and heroism will stay with me for a very long time. I am certainly not the first person to praise this book, of course (despite the Dutch fellow who threatened to burn it). The Book of Negroes won the 2007 Rogers Writers' Trust Fiction Prize, the 2008 Commonwealth Writers' Prize and the 2009 Canada Reads contest. It has also been chosen by the Calgary Public Library as this year's One Book One Calgary selection, the one book that all of Calgary should read. Addendum: Many thanks to my dear friend Matthew for passing along this book to me, which I just realized has been autographed. No take backs. Well, if you liked it, and Karen's going to read it, I'll add it to my list too. I do think you will enjoy it, Karen. It's excellent. I enjoyed this book. I keep thinking you would like his latest book, Blood. It strikes me as right up your alley. I actually liked it even more than The Book of Negroes. I need to go back and read some of his earlier works. Until the Book of Negroes I had never heard of him. I wasn't familiar with him prior to first hearing about The Book of Negroes either, Toccata, but while looking for an image of the book cover, kept running into mentions of Blood, and thinking "I would read that!". I loved it and echo your sentiments about Aminata. Will you be watching the mini-series? I had forgotten that a mini-series was planned, John, thanks for the reminder. I would certainly be curious to watch it, despite the fact that I will constantly be comparing it to the book. I wonder who will play Aminata?